The Province of Pennsylvania, also known as the Pennsylvania Colony, was founded in English North America by William Penn on March 4, 1681 as dictated in a royal charter granted by King Charles II. The name Pennsylvania, which translates roughly as "Penn's Woods", was created by combining the Penn surname (in honor of William's father, Admiral Sir William Penn) with the Latin word sylvania, meaning "forest land". The Province of Pennsylvania was one of the two major Restoration colonies, the other being the Province of Carolina. The proprietary colony's charter remained in the hands of the Penn family until the American Revolution, when the Commonwealth of Pennsylvania was created and became one of the original thirteen states. "The lower counties on Delaware", a separate colony within the province, would breakaway during the American Revolution as "the Delaware State" and also be one of the original thirteen states. The colonial government, established in 1682 by Penn's Frame of Government, consisted of an appointed Governor, the proprietor (William Penn), a 72-member Provincial Council, and a larger General Assembly. The General Assembly, also known as the Pennsylvania Provincial Assembly, was the largest and most representative branch of government, but had little power. Succeeding Frames of Government were produced in 1683, 1696 and 1701. The fourth Frame was also known as the Charter of Privileges and remained in effect until the American Revolution. At that time, the Provincial Assembly was deemed too moderate by the revolutionaries, who ignored the Assembly and held a convention which produced the Constitution of 1776 for the newly established commonwealth, creating a new General Assembly in the process. Penn, despite having the land grant from the King, embarked on an effort to purchase the lands from Native Americans. Much of the land near present-day Philadelphia was held by the Delaware (Lenni Lenape) who would expect payment in exchange for a quitclaim to vacate the territory. Penn and his representatives (Proprietors) negotiated a series of treaties with the Delaware and other tribes that had an interest in the land in his royal grant. The initial treaties were conducted between 1682 and 1684 for tracts between New Jersey and the former Swedish / Dutch colonies in present-day Delaware. The province was thus divided first into three counties, plus the three "lower counties on Delaware Bay". The easternmost, Bucks County, Philadelphia County and Chester County, the westernmost. It was not until several decades into the next century that additional treaties with the Native Americans were concluded. The Proprietors of the colony made treaties in 1718, 1732, 1737, 1749, 1754 and 1754 pushing the boundaries of the colony (still within the original royal grant) north and west. By the time the French and Indian War began in 1754, the Assembly had established the additional counties of Lancaster (1729), York (1749), Cumberland (1750), Berks (1752) and Northampton (1752). After the war was concluded, an additional treaty was made in 1768, that abided by the limits of the Royal Proclamation of 1763. This proclamation line was not intended to be a permanent boundary between the colonists and native American lands, but rather a temporary boundary which could be extended further west in an orderly manner but only by the royal government and not private individuals such as the Proprietors. This effectively altered the original royal land grant to Penn. 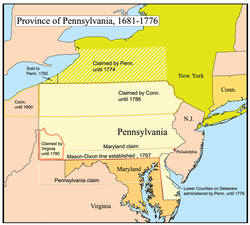 The next acquisitions by Pennsylvania were to take place as an independent commonwealth or state and no longer as a colony. The Assembly establish additional counties from the land prior to the War for American Independence. These counties were Bedford (1771), Northumberland (1772) and Westmoreland (1773). William Penn and his fellow Quakers heavily imprinted their religious values on the early Pennsylvanian government. The Charter of Privileges extended religious freedom to all monotheists and government was initially open to all Christians. Until the French and Indian War Pennsylvania had no military, few taxes and no public debt. It also encouraged the rapid growth of Philadelphia into America's most important city, and of the Pennsylvania Dutch Country hinterlands, where German (or "Deutsch") religions and political refugees prospered on the fertile soil and spirit of cultural creativeness. Among the first groups were the Mennonites, who founded Germantown in 1683; and the Amish, who established the Northkill Amish Settlement in 1740. 1751 was an auspicious year for the colony. Pennsylvania Hospital, the first hospital in the British American colonies, and The Academy and College of Philadelphia, the predecessor to the private University of Pennsylvania, both opened. Benjamin Franklin founded both of these institutions along with Philadelphia's Union Fire Company fifteen years earlier in 1736. Likewise in 1751, the Pennsylvania State House ordered a new bell which would become known as the Liberty Bell for the new bell tower being built in the Pennsylvania State House in Philadelphia. In 1737, the Colony exchanged a great deal of its political goodwill with the native Lenape for more land. The colonial administrators claimed that they had a deed dating to the 1680s in which the Lenape-Delaware had promised to sell a portion of land beginning between the junction of the Delaware River and Lehigh River (present Easton, Pennsylvania) "as far west as a man could walk in a day and a half." This purchase has become known as the Walking Purchase. Although the document was most likely a forgery, the Lenape did not realize that. Provincial Secretary James Logan set in motion a plan that would grab as much land as they could possibly get and hired the three fastest runners in the colony to run out the purchase on a trail which had been cleared by other members of the colony beforehand. The pace was so intense that only one runner actually completed the "walk," covering an astonishing 70 miles (110 km). This netted the Penns 1,200,000 acres (4,900 km2) of land in what is now northeastern Pennsylvania, an area roughly equivalent to the size of the state of Rhode Island in the purchase. The area of the purchase covers all or part of what are now Pike, Monroe, Carbon, Schuylkill, Northampton, Lehigh and Bucks counties. The Lenape tribe fought for the next 19 years to have the treaty annulled, but to no avail. The Lenape-Delaware were forced into the Shamokin and Wyoming Valleys, which were already overcrowded with other displaced tribes. Benjamin Franklin moved to Philadelphia at age 17 in 1723; during his later years he was Pennsylvania's most famous citizen. Among his accomplishments was founding in 1751 the Academy and College of Philadelphia, the predecessor to the private University of Pennsylvania. Franklin was also a strong advocate for a state militia, creating his own extra-legal militia when the state assembly would not during King George's War. Robert Morris moved to Philadelphia around 1749 at about age 14. He was known as the Financier of the Revolution because of his role in securing financial assistance for the American Colonial side in the Revolutionary War. In 1921, Robert Morris University was founded and named after him. John Morton was born in Ridley Township, Pennsylvania. He was a delegate to the Continental Congress and a signatory to the Continental Association and the United States Declaration of Independence. William Penn was the colony's founder and son of naval Admiral Sir William Penn. George Ross was born in New Castle, Delaware and moved to Philadelphia to practice law. He was a delegate to the Continental Congress and a signatory to the Continental Association and the United States Declaration of Independence. James Wilson moved to Philadelphia in 1765 and became a lawyer. He signed the Declaration of Independence and wrote or worked on many of the most difficult compromises in the U.S. Constitution, including the Three-Fifths Compromise, which defined slaves as three-fifths of a person for purposes of census-taking, number of members to be elected to U. S. House of Representatives, and government appropriations. Peggy Shippen was the daughter of prominent Philadelphia merchant Edward Shippen and wife of Benedict Arnold. ^ "About Pennsylvania". Archived from the original on 2009-10-14. ^ Rothbard, Murray N. (2005). "Pennsylvania's Anarchist Experiment: 1681–1690". LewRockwell.com. Retrieved 2008-07-02. ^ Rothbard, Murray N., Conceived in Liberty, Vol. II (Auburn, AL: Ludwig von Mises Institute, 1999), p. 64.